The Fane team in the UK production plant in West Yorkshire, England. Fane is a wholly British owned company with it’s headquarters located in West Yorkshire, England. We are committed to offering products of the highest standard, competitive pricing and support services needed to meet the changing demands of the pro audio market place. Established in England, 1958. Fane has a strong heritage and history in sound engineering excellence. Producing high-quality pro audio transducers. We are trusted and proven to deliver superior sound quality in the most demanding sound reinforcement applications, by the world’s most famous sound system designers, high quality musical instrument amplification brands and fixed installation companies. Our story begins when founding partners Arthur E. Falkus and Dennis A. Newbold established the FANE brand by combining the first two letters of their respective surnames (FA and NE) to create the name that would form the identity of their new company. FANE was established to manufacture commercial loudspeakers for radio and television sets as well as the new ‘hi-fi’ industry as the new technologies and economy of the post-war era saw a huge expansion in affordable consumer products. Fane Acoustics Limited, Batley, West Yorkshire, England, was officially registered as a Company on 11th June 1958. Drivers for household or reinforcement use were advertised in 1959. One unit was equipped with aluminium voice coil windings, a favourite technique of Arthur Falkus to extend high frequency response. From its inception FANE demonstrated the pioneering spirit that has comprised a core element of its ethos through to the present day. A vintage Fane car radio speaker. During the early years of FANE’s existence and rapid growth, the company supplied small round and elliptical speakers to manufacturers during the boom period of radio and television set production in the UK. From the start, FANE had also produced large 12-inch bass drivers for OEMs in the specialist hi-fi industry in addition to producing its own hi-fi products such as the ‘Quartet’ complete loudspeaker system. During this period production grew to exceed 50,000 units per week. Finishing and preparation of the iconic shape Fane speaker chassis. In 1965 Fane Acoustics developed the IonoFane, a revolutionary plasma tweeter capable of incredible high frequency response utilising patented technologies. The unit used a high frequency electrical discharge to produce sound waves by ionising the air in a small quartz tube coupled to a flared horn. IonoFane was used by the British Broadcasting Company (BBC) as a monitoring loudspeaker and Bower & Wilkins also made units under license to Sony in Japan. This served to expand FANE’s reputation globally as a pioneering brand with a true passion for innovation in audio. The IonoFane plasma tweeter circa 1965. In 1966 a young man by the name of Arthur Barnes joined Fane Acoustics as the press-shop manager. 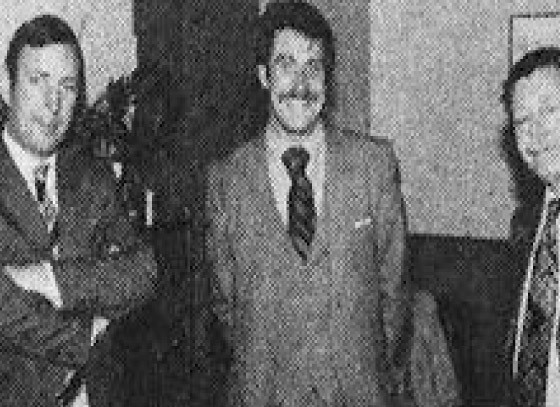 Arthur would progress through the ranks to become Managing Director and become the driving force behind FANE’s most globally successful period of the 1980s. Arthur Barnes (Centre) with David Biggs and Dennis Newbold. 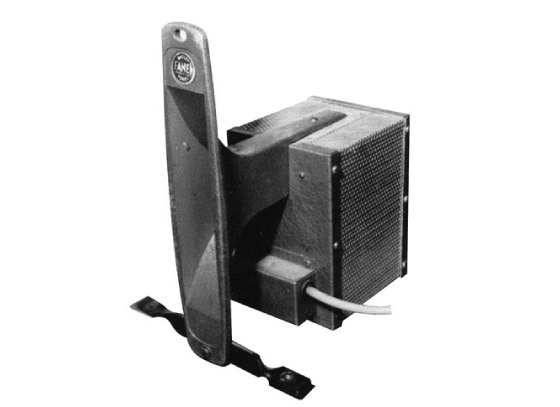 It was in 1967 that FANE made the significant breakthrough that would seal its reputation as a market-leading innovator. During the 1960s the electric guitar created the need for more powerful 12-inch loudspeakers. The real breakthrough for the industry, and from FANE specifically, came with Arthur Falkus’ development, presentation and use of the glass fibre voice coil. 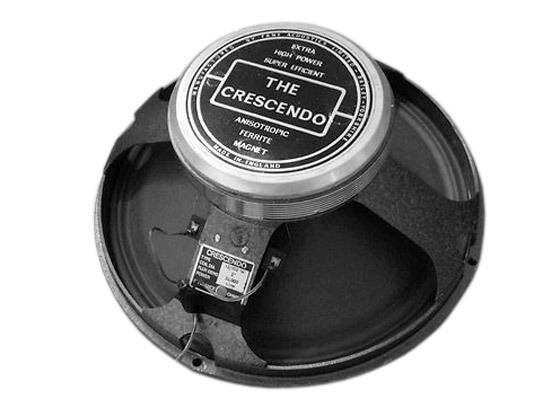 Overnight speaker power handling was doubled and the legendary Crescendo MI range was born. FANE became the first manufacturer to produce a speaker capable of handling 100 W and generate sound pressure levels in excess of 100 dB. The revolutionary and trail-blazing new speaker technology was highly successful. Almost all of the leading manufacturers of this time would come to load FANE components into their products during this and the following decades. World-renowned brands of the time such as Carlsbro, Hiwatt, Laney, Orange, Sound City and Vox were just a few of those FANE customers. Iconic artists such as Pink Floyd, The Who, The Rolling Stones and many more used equipment loaded with FANE speaker components, making FANE an integral part of the British music scene revered throughout the world. It is a tribute to FANE design expertise that other loudspeaker manufacturers, recognising the superiority of the glass fibre coil, replicated the use of this material for their own construction and making it an industry standard. Where FANE led the way, others followed. Modern 'vented'Fane voice coils still utilise Arthur Falcus' revolutionary glass fibre technology. 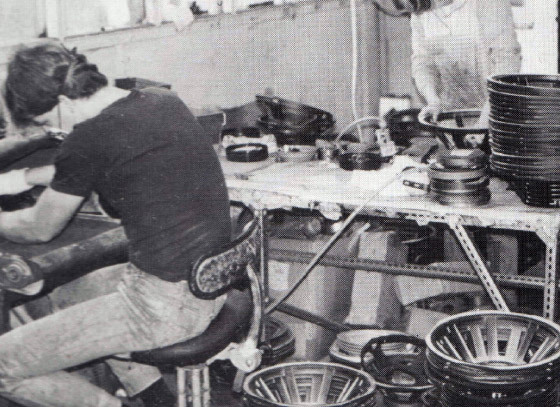 During the 1970s FANE went from strength to strength, increasing production capabilities and carrying out further research in loudspeaker technology and advanced construction materials. As FANE continued to further develop speaker technologies for high-power professional audio sound reinforcement, the FANE product range and OEM capability significantly expanded to cover a catalogue range of fifty products. OEM customers could select variations of cones, coils, dust domes and suspensions to modify product to suit their individual requirements, a service that FANE continues to offer today. It was during this period of growth and development that iconic loudspeaker ranges such as the Classic Series and Crescendo first appeared. By the mid-1980s FANE was probably the most significant professional audio component loudspeaker manufacturer in Europe. Another decade of continuous success saw increased FANE presence in high-end theatres such as Carnegie Hall, New York, and the Royal Theatre, Copenhagen. Turbosound, who selected FANE for all their custom designed loudspeaker requirements, were the choice of the world’s leading venues and entertainers. The new Studio series incorporating, amongst others, Colossus models, reflected the very latest developments in acoustic engineering. FANE “Towards Perfection” was a phrase used to reflect the pedigree and mission statement that the company was striving so successfully to achieve. New landmarks, such as the first commercially available 24-inch loudspeaker and 4-inch voice coils, enabled FANE to strengthen during this period under the leadership of Arthur Barnes. In 1986 respected English loudspeaker brand McKenzie was acquired as part of the audio group portfolio, another association that continues to the present day. In 1989 following years of success, and despite a resolute attempt to orchestrate a management buyout, FANE was purchased by the Wharfedale Group. Arthur left the company he had dedicated himself to and the tenure of the Barnes family association with FANE was temporarily ended. 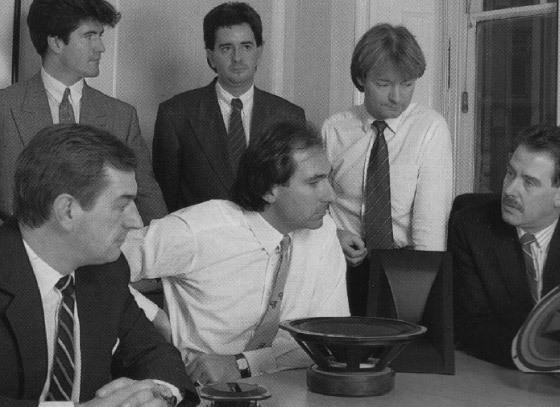 Audio Fidelity Group Directors, including Simon Cowell (top left), meet with arthur Barnes in the 1980s. A period of changes of ownership and lack of direction combined to make the next few years challenging for FANE. Introductions such as NXT flat panel technology did not achieve the desired success and the brand suffered from a lack of focus on the core values upon which it had been so successfully founded and developed between the 1950s and 1980s. A Fane loaded 4x12 speaker cabinet. 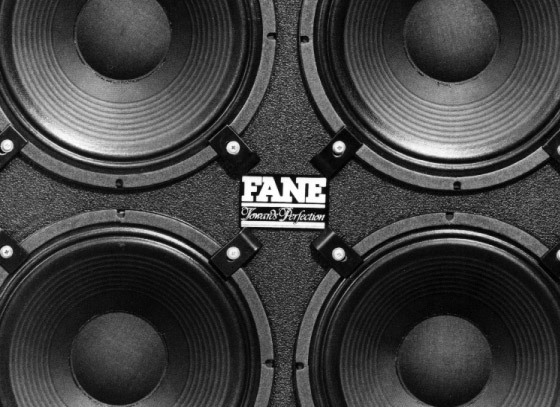 In January 2007 the Barnes family took the opportunity to purchase FANE with the objective of restoring the brand’s fortunes through refocusing upon core values and bringing a renewed expertise to the challenges of an audio market that had showed considerable change over the previous twenty years. 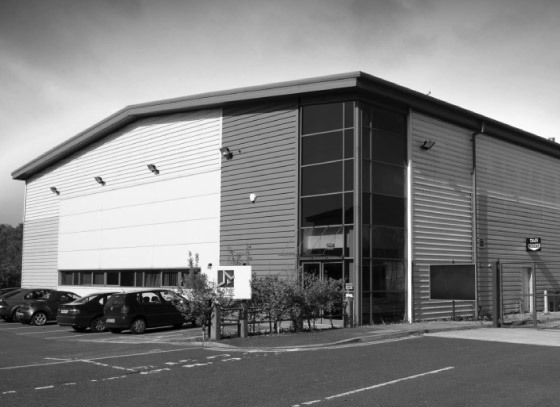 In 2007 FANE was relocated from its then manufacturing plant in Leeds to its current home at our headquarters in Castleford, West Yorkshire, England. Fane's present day headquarters and manufacturing plant in West Yorkshire, England. In 2008 the FANE product line was officially re-launched under the ownership of the Barnes family with headquarters still located only ten miles from the original FANE factory in Batley, West Yorkshire. At the outset of the new ownership, key FANE staff who were employed during the 1970s and 1980s were recruited to give the team strength in expertise, commitment to continuous improvement and authenticity to the core FANE character. Not so much a brand purchase under new owners, it represented a ‘coming home’ for the management team after a period interrupted in 1989. The FANE catalogue of components was carefully reviewed and analysed. A complete product overhaul was conducted to ensure the renowned FANE qualities of incredible performance without compromise are firmly adhered to, the result being a comprehensive range of components from 5-inch through to 18-inch loudspeakers. The FANE Sovereign Series was created with both heavy duty pressed steel and cast aluminium frame options to provide a new range of product options optimised for the requirements of the current professional audio industry and subject to a programme of continuous improvement in which specifications undergo constant analysis to ensure that they represent the best they can be. The opening of our offshore manufacturing plant enabled FANE greater competitiveness to meet the challenges of a market in which the number of rival brands had increased exponentially at the same time of vastly increasing production output. By bringing FANE closer to key growth regions, FANE has been able to develop market share in the great emerging world economies. The launch of Colossus PRIME 18XS saw the arrival of another legendary FANE high power 18-inch drive unit to stand alongside the mighty Colossus 18XB. The PRIME 18XS displayed the hallmarks of FANE ingenuity to deliver an incredible peak-to-peak excursion in excess of 60 mm to ensure fast, accurate bass in the most testing of performance environments and engineered to provide significant advantages over competing European products. The PRIME 18XS represents just one of the many new product developments over the past decade of FANE audio engineering, each model carefully considered and engineered to provide an audio advantage for the OEM, excelling and not just performing in the target application. FANE continues to dynamically engage with a continually changing global audio industry, evolving to the demands of the present time while being faithful to our original maxims of being at the forefront of audio design and engineering and innovative in our approach to predicting future market trends and requirements. In 2018 we celebrate our 60th anniversary as a brand and ten complete years under the Barnes family ownership with a direct link through to the early days of FANE back in 1966.
roach with one founded in the values that makes FANE great. A labour of love as well as of professionalism and expertise. With direct business-owner to business-owner communications and commitment to world class standards and professional excellence we welcome working with business partners around the world to forge a strong and successful future together. 2018 underlines our continued commitment to product development and innovation with the launch of FANE Imperium™ a formidable addition to our professional range of products to stand alongside the Colossus Series, delivering outstanding efficiency to provide a definitive performance advantage and another legendary FANE product for the future. WHAT MAKES FANE LOUDSPEAKERS SO SPECIAL? No compromises are made on design and component specifications to guarantee only the finest audio performance. 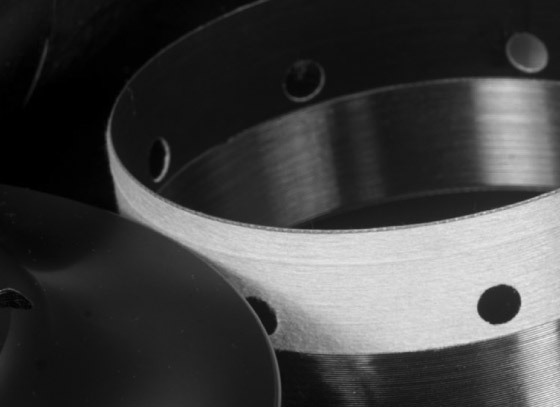 Only the highest quality materials sourced from the world’s most respected suppliers are used in our quest to produce the perfect transducer solutions. Designed at our headquarters in the UK, Fane produces a comprehensive range of matchless chassis loudspeakers in the standard diameters, with versatile mounting facilities designed for convenience and security. In addition to chassis loudspeakers, our professional product range includes an outstanding series of compression drivers specialised to cover the high frequency bandwidths. Devices of innovative design, skilful engineering and superb performance.